Arc welding generates visible light, infrared and ultra violet radiation, which can damage eyes and skin. 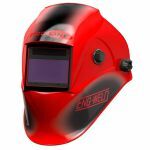 The Pro-Line Large View Light Reactive Welding Helmet offers the latest innovative protection for the welder and now incorporates the latest True colour lens technology offering natural colour & contrast when the welding filter is in it's light state. Welders will be able to really see the difference when focusing on welding set-up, technique, precision grinding, and inspection of welds. Slim and lightweight in construction. Manufactured from a high impact polyamide nylon material which ensures the helmet provides high levels of comfort and durability. The metallic paint finish ensures maximum heat reflection.